When Ronel and her team of artisans are at work, hand-felted South African merino wool is transformed into designs inspired by her favourite shapes in nature – from giant pebble stools to floral cushions and seashell poufs. Revering the organic properties of this versatile material, she steers away from the traditional chemical method of carbonisation and uses lead-free dyes and biodegradable soaps in her process. The result is a multifarious range of felt products that introduce eco-conscious sensibilities to the home. 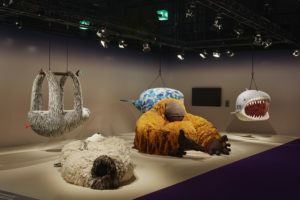 It’s no surprise that internationally acclaimed designer Porky Hefer sought out her expertise for his latest project – the Endangered series in collaboration with Southern Guild, commissioned by SFA Advisory for the Leonardo DiCaprio Foundation. Debuted at Design Miami/Basel in June 2018, the pieces co-produced by the Ronel Jordaan team include a snuggly orangutan and a reposed polar bear. 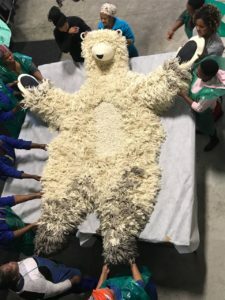 ‘We loved the challenge of creating larger-than-life soft ‘toys’, knowing they are for a good cause,’ she says (25% of all profits go toward the Leonardo diCaprio Foundation’s work in climate resiliency, protection of vulnerable wildlife and the restoration of balance to threatened ecosystems and communities). That these animals were produced with a renewable fibre coming from sheep not subjected to mulesing practices made the choice a conscious one for Porky and his collaborators. Each animal is stuffed with polyester formed from recycled plastic bottles, all part of Ronel’s approach to maintaining environmental awareness throughout her production process, an ethos perfectly suited to the eco-friendly brief for these collectible, designer animals. 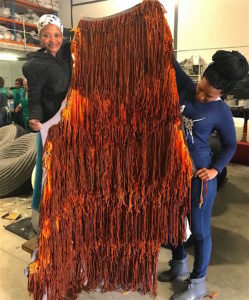 Having personally trained her team in the art of felting, Ronel continues to empower the women who work with her, affording them the opportunity to create items of value for people and for the environment. Her homeware range for Source is another manifestation of this journey, where products are created with sustainability and a deep respect for the environment from which all materials are sourced.